See the latest progress on the new features opening this spring! and interior paintings for Carol Ann’s Carousel! Watch the Fall, 2014 construction update for fun surprises! Building a World Class Carousel in Smale Riverfront Park! The Fall, 2013 construction update features progress on the Vine Street complex, the Adventure Playground, and plans for the anchorage below the Roebling Suspension Bridge! The Late Summer, 2013 construction update features progress on the new Vine Street Fountain & Stairs and the new Heekin/PNC Grow Up Great Adventure Playground. In the Spring, 2013 construction update, see how the park will double in size with the opening of the newest features! The Mid-Spring Construction Update: The May 18 Grand Opening of Phase I Features is just days away! The Spring Construction Update: Get ready for the May 18 Grand Opening of Phase I Features! The Christian Moerlein Brewing Company commissions a limited edition Rookwood stein to commemorate the opening of the new Moerlein Lager House. The Mid-Winter Construction Update: Phase I Features Nearing Completion! Get your first look at the dramatic mural for the Moerlein Lager House Grand Staircase. The Women's Committee for Cincinnati Riverfront Park: Bringing it Together! Riverfront Fusion-The FIRST FREE public concert in Cincinnati Riverfront Park! Coming May 26! The Moerlein Lager House is under construction and the Schmidlapp Event Lawn will open soon! Watch the Late Spring 2011 construction update. More than a park—we're building a destination! It's the Winter 2010-2011 Construction Update! We've got PROGRESS! 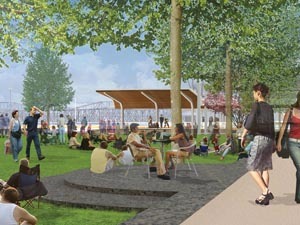 Get the latest on construction progress at Cincinnati Riverfront Park! Take a good look at Phase I construction progress! The 2010 Hats Off Luncheon featured the exciting launch of the Twig Project! Watch the video of all the fun at the 2010 Hats Off Luncheon! Video featuring the story of Cincinnati’s Civil War era Black Brigade and the monument being planned in Cincinnati Riverfront Park to commemorate their valiant service.